Incorporates a combination of amino acids and additional elements to ensure a good assimilation by the corals LPS. 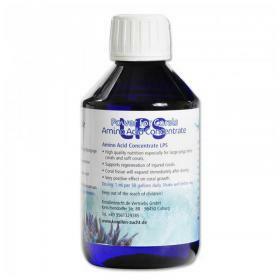 Nutrition concentrate elav quality for all corals is more suited to LPS, including x soft corals. With this product Laggiunta notice an immediate expansion of the tissue of corals. Stimulate maximum growth in the SPS. Speed up healing in damaged corals. Recommended for all types of pool without ZEOvit.